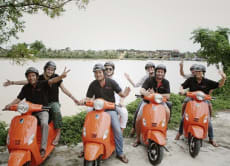 I hope to make Vietnam a better place by providing electric scooter tours for travellers to use while they explore the beautiful quanit town of Hoi An. I support the local community and actively support international NGO's such as Streets Restaurant and Lifestart foundation. Join me on my electric scooter tour to have a one-of-a-kind experience in an eco-friendly way.